Rapidly globalizing markets can be a treasure trove of opportunities for app developers and service provides. In today’s fast-paced environment, those opportunities can outweigh those of more developed markets. Because of that, identifying such opportunities is usually more complex, and requires more data. 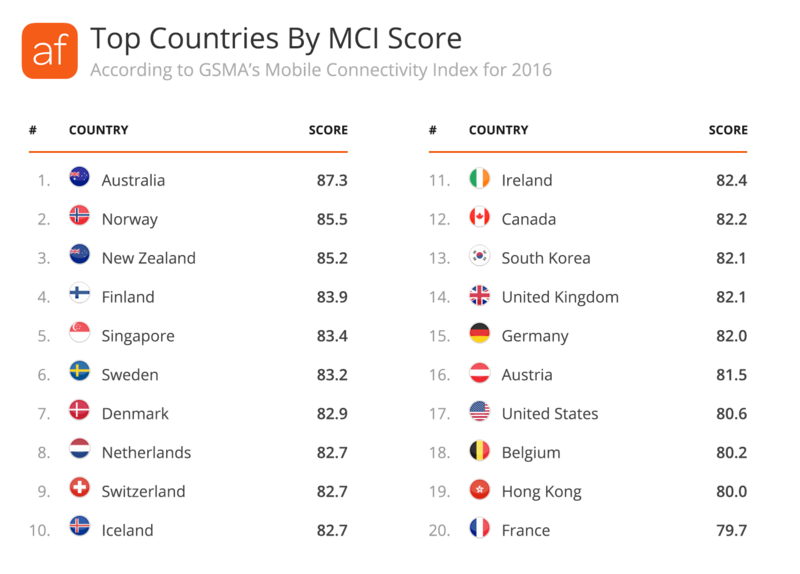 That’s where GSMA’s Mobile Connectivity Index (MCI) comes in. 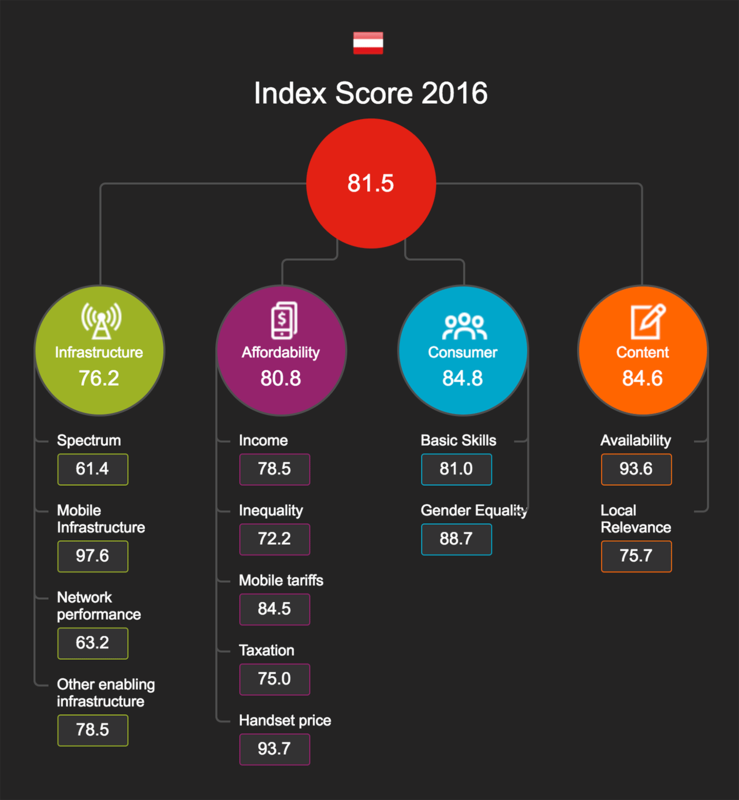 What is the GSMA Mobile Connectivity Index? The MCI is a massive collection of indicators ranging from a country’s mobile infrastructure to the number of apps localized and available in the country. 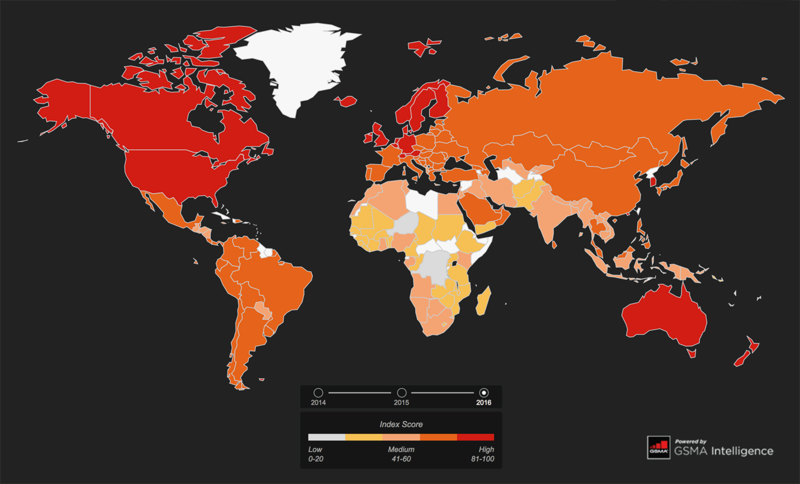 Those indicators are than weighted, aggregated, and indexed to provide a score for every country. To earn a high score, a country needs to have the supporting infrastructure, cultural readiness, affordable devices, and a variety of apps. Lower scores indicate that the country might be ready for these things, but isn’t quite there yet. We like big datasets that have to do with mobile data, as you can imagine. We also provided some of those indicators, so we were particularly excited to dig in. In this post we’ll share some of the insights we came across. Let’s start at the top, literally. Here are the 20 countries with highest overall scores. Australia leads the way with a whopping 87.3, with Norway (85.5) and New Zealand (85.2) right behind it. The U.S., to our surprise, came in at #17 with a score of 80.6. 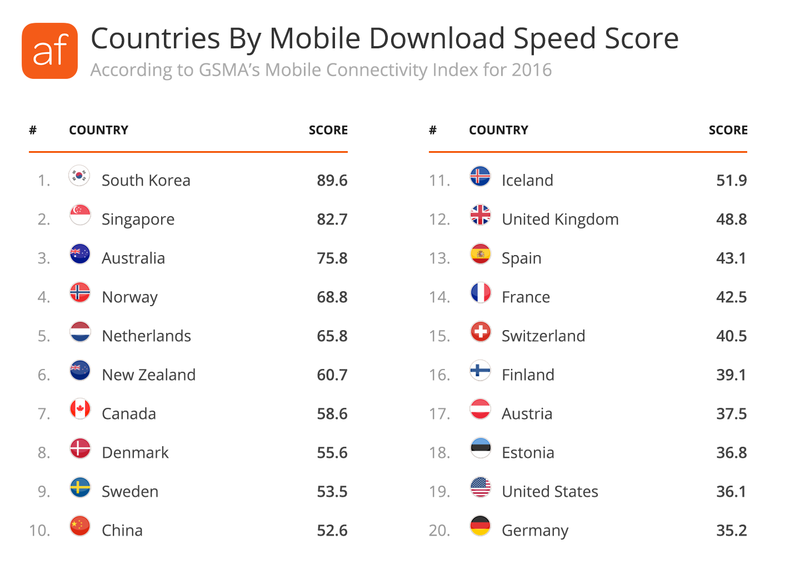 The first thing we noticed while looking at download speeds is the difference between #1 – South Korea, with a score of 89.6 and #10 – China, which scored a 52.6. That’s a difference of 70%. Another thing we quickly noticed is that just like the overall rankings, both the US and Germany did not make the top 10. In fact, both closed the top 20 list in #19 and #20 respectively. There are countries that are very ready for mobile connectivity, but don’t have affordable options. Madagascar, for example, has a consumer score of 62, but only rates 27 in affordability. This means that the citizens of Madagascar are literate and educated, but handsets, service plans, and taxes are prohibitively expensive. The Solomon Islands have a consumer score of 54, indicating that citizens are getting ready for mobile connectivity, but the costs are expensive there, as well; their affordability score is only 40. With a population of around 600,000 people that may not be as big of a market, but for the right apps and services this could be a nice opportunity. These countries need affordable options, and it’s only a matter of time until providers start offering broader services there. Even developed countries like Indonesia, Ecuador, the Dominican Republic, and Brazil show notable discrepancies between these scores. The app situation is similar. Many countries have higher consumer scores than content scores (which are determined mostly by the number of local-language apps available), indicating an opportunity for content creators. Take Albania, for example: a consumer score of 76, with a content score of only 38. The lack of localized apps is especially dire in Africa. Many African countries have very low content scores, but their readiness is consistently rising. Any developer who can take advantage of this fact will be well-received. Knowing which countries have the high consumer scores and low content scores can help developers focus on those markets and gain more downloads. If you’re a translation or localization company, now’s the time to offer your services to those developers. 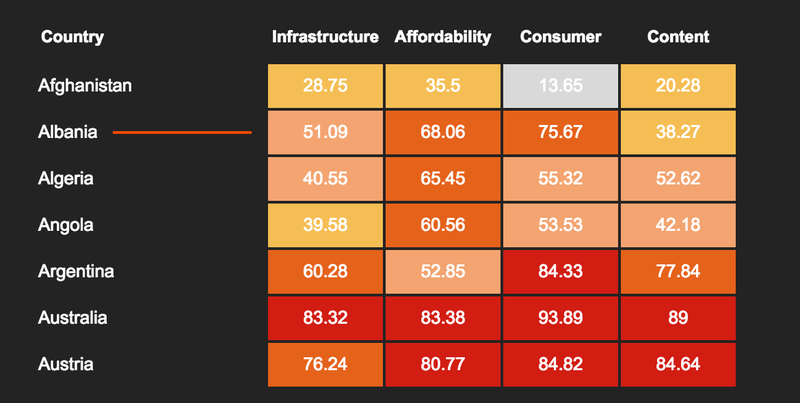 We looked at the change in infrastructure scores between 2014 and 2016, and ranked countries based on their 2-Yr growth numbers below. 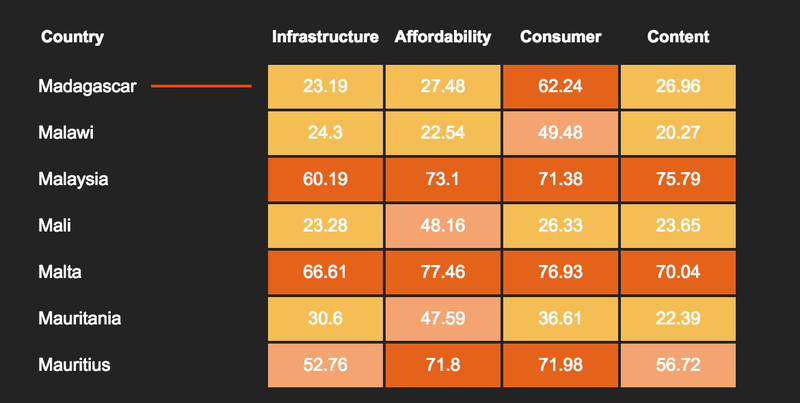 It’s easy to see which countries are making big investments in mobile connectivity infrastructure. While there are some patterns, it’s clear that countries all over the world are preparing for significantly improved mobile connectivity. 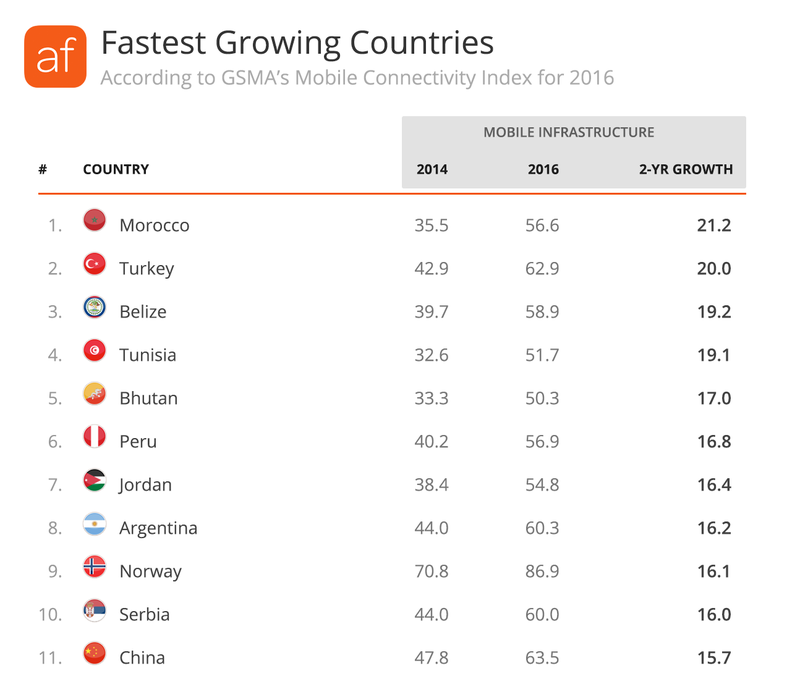 The top five countries with significantly improved mobile infrastructure are Morocco (21), Turkey (20), Belize (19), Tunisia (19), and Bhutan (17). Those are five vastly different countries in very different parts of the world, but they’re all making big steps in their mobile connectivity. And that means they’re going to be significantly larger markets than they are right now. Better get in early! There’s a lot of talk in the app world about making lighter apps, but that’s only because the infrastructure just isn’t there in some countries. That seems to be changing though. 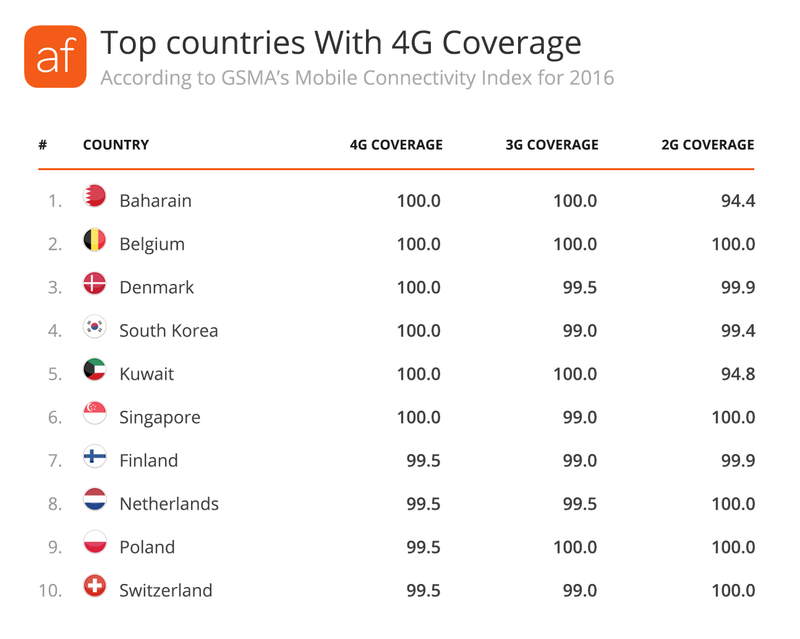 A full 30% of the countries in the Index already have 90% or greater 4G coverage. And the six countries that have 100% coverage might surprise you: Bahrain, Belgium, Kuwait, Denmark, South Korea, and Singapore. Some of these might be a good place to soft-launch your apps. When you think of high tariffs, you might think of Scandinavian countries or, more broadly, Western Europe. And you’d be right. But the countries with the highest mobile tariffs don’t fit so neatly into this box. 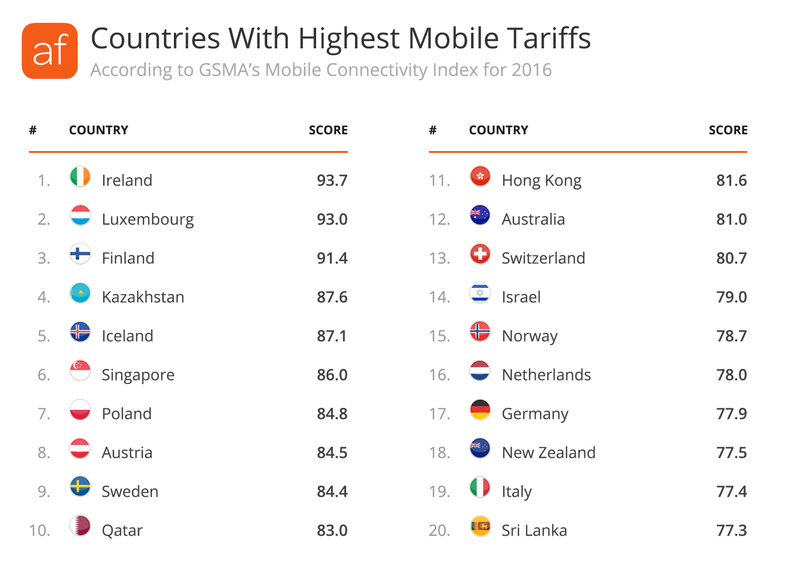 Ireland, for example, had the highest mobile tariffs in 2016. Kazakhstan was #4, followed by Iceland. Qatar, Hong Kong, Israel, and Sri Lanka also make appearances in the top 20. Again, if you’re thinking about doing business in these countries, that’s something to take note of. The MCI is a great resource for developers and service providers. We highly recommend giving it a good scan. We’d love to hear what you got out of the MCI. Leave a comment below. The index uses data from a wide variety of datasets to provide a comprehensive score. We provided data on app availability as well as where developers are based in. Other datasets came from sources spanning industry groups, telecommunications providers, international organizations like UNESCO, the UN Human Development Index, the World Bank, and the International Energy Agency. Looking for mobile data? Get information on apps, developers, and SDKs using Explorer.